Scotland play Poland and Gibraltar in their last two Euro 2016 Group D qualifying matches in the coming week with their chances of reaching the finals in France in the balance. 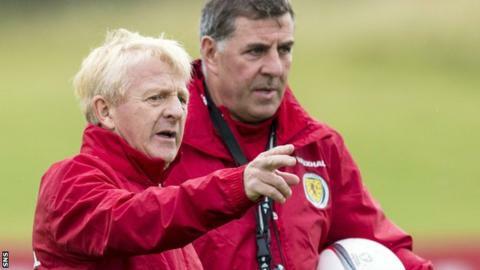 Unlike group leaders Germany, Poland and the Republic of Ireland, Scotland in fourth place cannot now claim one of the two automatic qualification spots. And their fate is not in their own hands. Their 3-2 defeat by Germany at Hampden last month leaves them four points adrift of third place and a play-off against another third-placed team for a spot at the Euro 2016 finals in France. Germany need only one more win to guarantee a top-two finish. Can Scotland overtake Republic of Ireland? If third-placed Republic of Ireland lose to Germany on Thursday and to Poland in the final round of games, then Scotland can clinch third place by taking four points from their remaining games against the Poles and Gibraltar in Faro on Sunday. This would leave Scotland and the Republic of Ireland on 15 points apiece, but Scotland would go third thanks to their head-to-head record. If Scotland win their final two Group D matches, even two draws for the Irish against Germany and Poland would not be enough for them - Poland would finish second on 18 points, Scotland would be third with 17 points ahead of Martin O'Neill's Ireland for that win and a draw against them. One win for the Republic against either of their opponents would end Scottish hope of catching them. Poland may be six points ahead of Scotland but if they were to lose at Hampden, Scotland could leapfrog them, by dint of their better head-to-head record, with a win over Gibraltar. Of course, that scenario relies on the Irish winning in Poland on the same day. So, Scotland need points and the right combination of results elsewhere, but reaching the finals of a major tournament for the first time since the 1998 World Cup remains possible.